Scarlet Witch enters the field and the Phoenix Force powered X-Men are brought to a shift in focus in their battle to put down the Avengers. Those thought to be untouchable were suddenly shocked to find her hex powers were able to deflect them and also injure them. The mission is clear now, get Hope back and contain the Scarlet Witch so they can continue the seizure and closure of the Avengers projects and team. The issue progresses like a whirlwind, both sides locked in tension to try to establish an upper hand, unfortunately for the Avengers they only have one tool on hand and limited resources to counter the Phoenix Force power. It’s an ugly battle and we see one major ally to the Avengers get BBQ’d during the assault that sends everyone into a massive motivational pitfall. This isn’t to say the Avengers are outclassed but they have done so much over so little time to really bring about no mercy at all from this revolution. 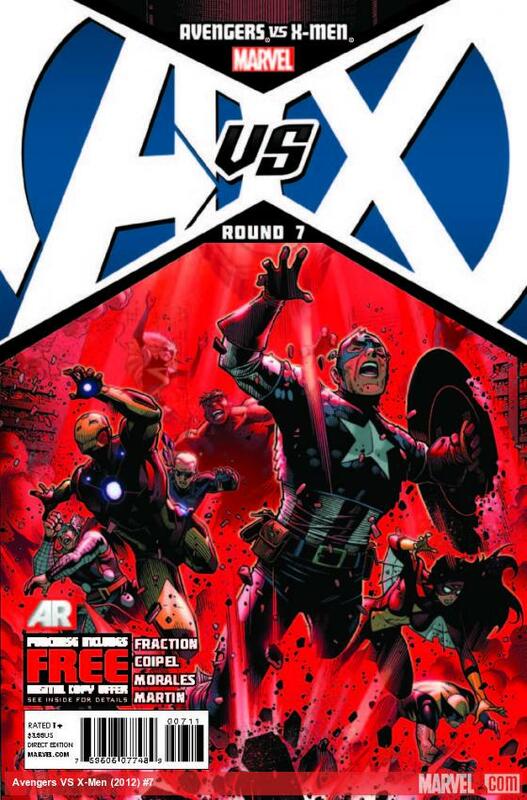 Overall the authors and artists deliver an emotional issue in AVX #7, is Wanda really ready for what Stark and company plan to ask of her in this battle? From the current standing it seems like she’s really out of her element and acting simply on desperation to do something during this turbulence. Expect this story to actually cross over to last weeks issue of New Avengers #28 as well, actually to that entire back story around the Iron Fist and also that little thing of ALL OUT WAR. Because someone is very angry on the Phoenix side and it’s going to get ugly in issue #8. Doing this in the wrong order but its worth putting out there for fans on the fence about buying this one. 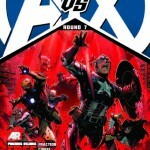 AvX Infinite #1 is actually a digital installment to this new series from Marvel. Focusing on more involved story telling using interactive panels that develop as you click along. Let’s get started on this new adventure into the fresh series of AvX. Infinite #1 tells us the story of Nova and his race to Earth, for those of you who read Avengers vs X-Men already, a big question did revolve around Nova just appearing at random and spiraling into the planet with no real control. Infinite is a unique chapter to get a feel for what these guys are really up against and the trek that Nova made to alert the planet to the threat coming their way. The Phoenix force is coming and that’s the big worry, but we see how powerful it is and how Nova pushes his very limits to relay the warning. While some might hope for more details around the conflict itself, the story stays largely contained to a safe area so that readers without the means to get Infinite aren’t robbed of crucial pieces of the story. As a new format the delivery is unique, allowing the author to give pause and direction through the pages of the read so that emphasis can be made as needed. Things that would normally cost valuable page space can now be considered like state of being or drama in the moment. A few scenes used Gaussian blur to show poor vision after impact and even visual attention back to Nova. Being able to go from shock to distress with a click was a pleasing experience as you normally inject those frames in with your own mind or sometimes even miss out on what the context was. 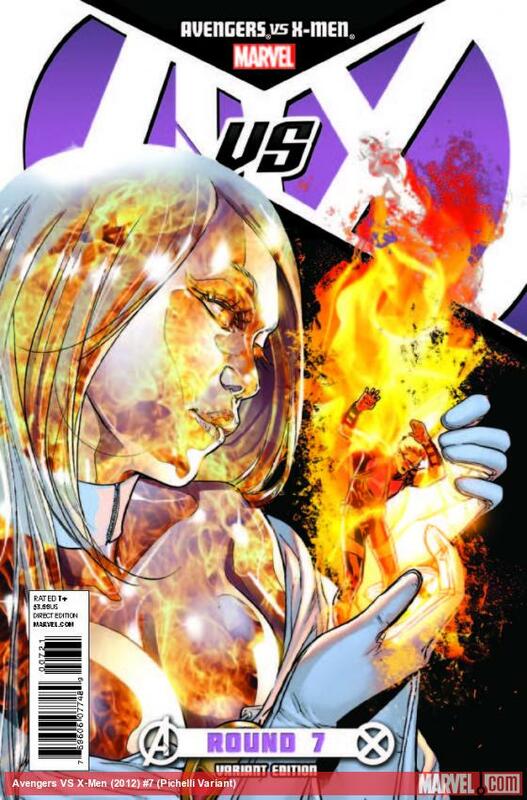 Is AvX Infinite critical to your collection? No, would it have worked as well in print? I have my doubts, needing to arrange the panels in such a way to tell the story in print would have consumed quite a bit of paper and required a price hike in the process for something that would have gotten lost in translation. As a fan though I thought the installment gave just enough information to be worth the investment, after reading the current AvX issues 0 and 1 it was a point that bugged for clarity to me even if it was used for an experimental format. The only flaw I really hit with the book was the final panel, while the rest of the art stands pretty high, Captain America’s face in the last scene is just troubling, a little extra time would have gone a long way on that face. 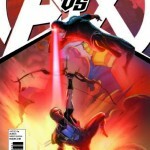 Avengers vs X-Men is here, we’re taking a step back and looking over issue #0 before jumping into our review of issue #1. 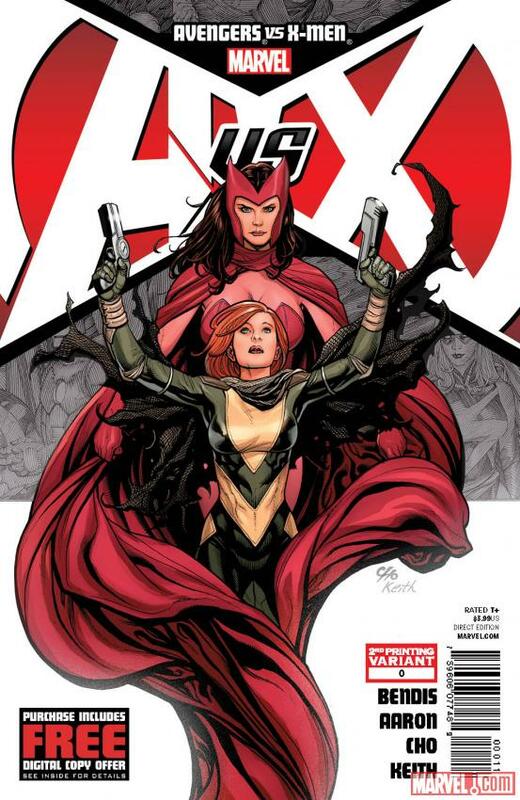 We get to see all the major players coming into the story including Scarlet Witch and Hope Summers. Issue #0 opens up to classic trouble on the horizon, M.O.D.O.K. and his crew are on the move but confronted by Scarlet Witch a still troubled ex-Avenger, the battle breaks out with full force and backup soon arrives. Happy reunions are anywhere but in this story, while her close companions want to help her cope with the aftermath and find some salvation in this mess the rest of the team lacks such compassion. 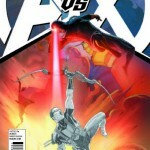 Overall Avengers vs X-Men #0 is a good intro, it’s the calm before the storm and honestly it’s not that calm at all, the tensions are high with the Avengers vs Scarlet witch or more specifically with Vision and her. 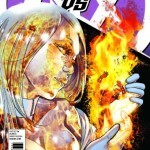 Hope and the X-Men are riding at high stress levels regarding the future and protecting her from any future threats, given people have traveled through time and space to get her out of the picture it’s understandable for them to be worried about the worst coming true.Conflict doesn’t hit these teams just on a wider team level but all the way to the individual level, Hope graces the pages of issue #0 and her tension with Cyclops also comes through, being caged up for so long isn’t exactly sitting with the one claimed as the mutant messiah and she’s ready to break. All the bad experiences from losing Cable still surround her and she finds that she needs a little more to vent in this world and cope with it all. Unfortunately her version of venting drives a bit more trouble than Cyclops and the X-Men might desire. The rocket pack flying Hope moonlights to pass her frustrations and do some good in the world on her own time outside of the X-Men, it’s a good thrill to see in the book and helps setup her position in what’s coming toward her life. Artistically it’s a fluid book, the pages are action filled and the page is the canvas, by that I mean even the panel borders can’t contain what’s breaking out in the Marvel universe right now. Color is solid, emotions are well portrayed and gestures are spot on and it all carries itself without going too far into a realm of realism or photo effect as we see alive in other series. It’s a positive shift and it plays well to this being a fantasy universe more than something closer to home. Cho and Keith drive it hope with a full range of color and strong body language. 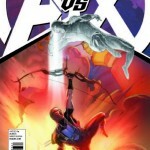 Marvel certainly has their hands full with AvX, the company announced that they’ve run out of copies of #0 to Diamond but there will likely be retail chains still holding onto a small pool of them still. As a result Marvel is going back into printing and putting out a new variant second edition to help cater to fans eager to catch how this new saga is going to kick off. 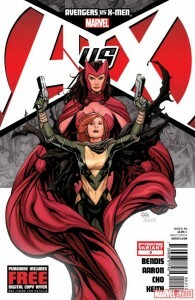 Given the issue helps elaborate on The Scarlet Witch and Hope Summers leading into this it’s no surprise that everyone is grabbing it. Frank Cho is heading up the cover for the second print variant, hopefully this one lasts a little longer than a day otherwise Marvel will really be in trouble with the fans. Honestly while I like the current issue 0 cover I really want that variant because it looks awesome. This is going to be a hard series to follow if the art keeps to this level of temptation in each issue. Check out the full size image to the right for a better look.